What happens if the tips of the leaves accidently get cut my a lawn mower? Clean up the damaged areas by trimming the leaves at an angled cut. 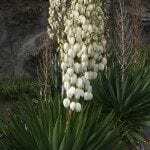 Yucca are quite tuff and should recover.